Burgas is the largest town on the southern coast of Bulgaria. It is located near the Bulgarian resorts with the best beaches – Sunny Beach, Nessebar, Ravda, Sveti Vlas, Pomorie, Primorsko, Sozopol, Kiten, Lozenets. Burgas is an important industrial centre and a transportation hub as well as a tourist destination and a starting point for tourists traveling south. The town offers a dynamic life, a spacious beach, a coastal garden and several interesting museums. If Burgas is the starting point of your trip, iRent has an office at Burgas Airport, where you can rent your car. iRent also offers you delivery to Burgas and apartments for rent for your perfect holiday in Burgas. 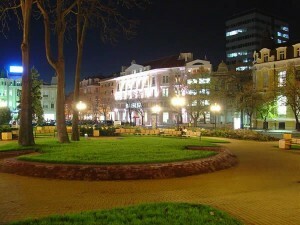 The best time to visit Burgas is the summer when the town centre is full of tourist crowds who head to the marine park. In town you will find clubs, bars and discos as well as museums and interesting galleries. And if you are a nature lover, Burgas will offer you four lakes with their protected bird species which can be enjoyed in the vicinity of the town. The best way to get to know Burgas is to rent a car. After you choose Place, Date and Time of Receipt, you will be taken to our result page with all the available cars for the desired period. Consider carefully what kind of car you will rent. If traveling with children or a lot of luggage, you will probably need a big sedan, a minivan or a SUV. On the other hand, if you are looking for the most advantageous offer for you, you might have to book the smallest class rental car or take a look at the recent reductions we offer in promotion section. iRent offers many additional extras such as ski rack, roof rack, snow chains, baby seats and GPS system. You can choose the extras that you wish for on third step of the reservation process. Irent offers the most advantageous prices on the local market especially for long-term rents. The final price includes 24/7 road assistance, unlimited mileage, insurance, vignette, CDW and TP. You shall always read the conditions on the contract when renting a car Read the conditions carefully before confirming the reservation. If you are not perfectly aware with anything please do not hesitate to contact us. 5. CDW – evading responsibility if damage occurs up to the amount of the deposit. This is valid only if a protocol from the traffic police is available. It is not valid if there is a drug-or-liquor abuse and not following the traffic law. 6.TP – evading responsibility if theft occurs up to the amount of the deposit only when the car keys and documents and the protocol from the traffic police are available. When pick up the car our associate will help you in looking it for possible scratches and damages. All the details will be marked in the protocol for the rent. Check the mileage, and all the lights for problems. If you establish one please inform our associate. It is very important before leaving the parking area to know the hired car very well. Check where the tank is, how to turn on the blinkers, the lights and the wipers. Pay attention to the basic things like the color of the car, registration number, the model of the car – so you will not lose it when parking it for the first time on a crowded and busy parking area or on a small street. Search the map carefully. Our associate would give you a map if you need one. Define your route before leaving. Always fill the tank up. Before leaving the car to us do not forget to check for the last time for anything forgotten. However, if you have forgotten anything do not worry we will contact you. Just start your perfect journey with Irent. You need a driving license. All the citizens of the EU and Switzerland can use their licenses because Bulgaria is a member of the EU. If you come from a country that is not a member of the EU you can use your license for the period of 1 year. Seat-belts are obligatory – on the front and on the back seats. All the persons below 12 years are not allowed on the front seat. It is obligatory to drive with turned on head-lights all day long in the period 01.11-01.03. Irent advises all its customers always to turn on the head-lights. Cell phones are forbidden during driving excluding the hands-free items. Parking is allowed only if there is a parking sign available. In Sofia there are parking areas marked in green and blue where you can park your car after paying the toll by sending a message on 1302 or paying directly to the employee of the company “Parking areas and Garages”. You pay per hour. After sending the message you shall receive a confirmation for the payment. You will be notified when your period is over. In larger cities there are a lot of prepaid parking areas – the price is around 2 lv. If you shall travel by plane you can use our service parking area on the airport. This is a very appropriate way to guarantee a parking spot on the airport you will depart. Burgas is located near the Bulgarian resorts Sunny Beach, Nessebar, Ravda, Sveti Vlas, Pomorie, Primorsko, Sozopol, Kiten, Lozenets. iRent offer direct deliveries to all sea, ski and golf resorts in Bulgaria. If you need more information about supply and transfers we offer, please see our website with additional services.